Virginia Dare’s Birthday is an annual observance celebrated on August 18 on Roanoke Island in North Carolina, United States. It honors the first English child born in the New World. During the past four centuries, Virginia Dare has become a prominent figure in American folklore, partly because she and her parents were members of the Lost Colony of Roanoke. Virginia Dare was born to Ananias Dare, a London tiler and bricklayer, and Eleonor Dare (née White), the daughter of John White, the governor of the notorious Roanoke Colony. They decided to leave England for the New World despite the fact that Eleonor was heavily pregnant. 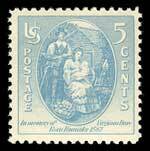 The settlers arrived in North America on July 22, 1857. On August 18, Eleonor gave birth to a girl who became the first child of English parents born in the New World. She was named after her birthplace, the territory of Virginia. Several months after his granddaughter’s birth, John White sailed for England for fresh supplies. He returned to Roanoke in 1590, and found that the colony had been long deserted. Nothing is known for certain about what happened to Roanoke Colony and what became to Virginia and the other colonists. Over the years, Virginia Dare has become a prominent figure in American myth and folklore, representing different things to different people. Her birth anniversary is still celebrated on Roanoke Island.